In traditional Chinese medicine, a person’s health is incumbent on the body reaching internal temperature equilibrium. Food is one way to correct any imbalance. Those who have too much internal heat are encouraged to eat “cooling” foods (like pears and tofu), and those with insufficient heat are told to eat “warming” foods (like beef and grapes). As an adolescent, I had poor blood circulation, and a Chinese doctor suggested I eat fresh snake gall bladder, known for its superheating abilities. My mom took me to a night market in Taipei, where I downed a small glass of bloody gall bladder mixed in with a little liquor. Maybe it did work, because my blood circulates fine now, and I’ve been known to walk around outside during Toronto winters in shorts. 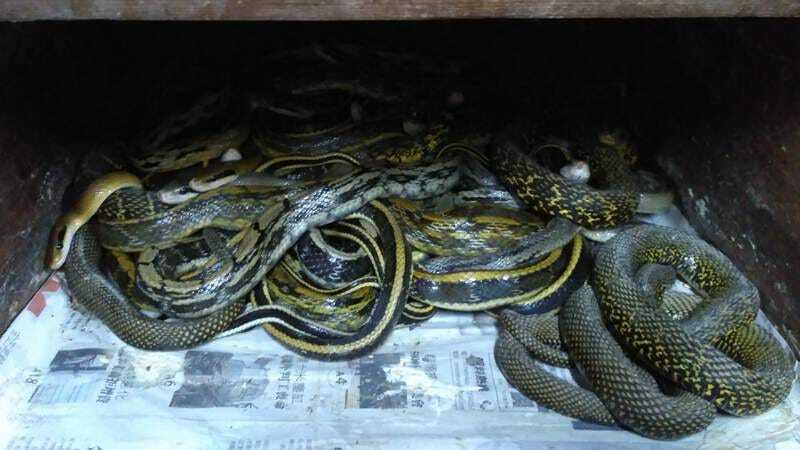 Although Mak managed to shade an entire snake industry in Taipei, I have to concede that Cantonese people have the advantage here, as they have been eating snakes for more than 2,000 years in China’s Guangdong province. Snake soup has been credited not only with warming the body but also alleviating respiratory, joint, and kidney problems and just generally increasing vitality. In addition to his Cantonese upper hand, Mak has been working at She Wong Lam for more than 70 years, and the shop itself has been around for more than 125. She Wong Lam claimed to be the first snake shop in Hong Kong to sell fresh snake meat, snake soup, and products like snake blood liquor and snake bile. It continues to ply its trade in the slowly gentrifying neighborhood of Sheung Wan amid shops selling Chinese medicine, dried seafood, and now, third-wave coffee. Mak learned to butcher and cook snakes from the old masters who once worked at the shop, and he still butchers fresh snake meat at the back of the shop for customers to take home. She Wong Lam’s snakes are sourced from the wild, caught mostly in Malaysia and Indonesia. There’s a variety of species to be found, from Chinese rat snakes and Chinese cobras to sharp-nosed pit vipers and banded kraits. There were no orders for fresh snake meat that day, and I wasn’t about to bring any home after Mak said that it takes at least four hours to cook snake soup to draw out its full benefits. Instead, I settled for a bowl of She Wong Lam’s soup, which contains five species of snakes. The snake meat is first steamed for two hours, before getting sliced and added to broth. The resulting bowl is brownish and thick, with slices of snake meat mixed in with mushrooms, chicken, and herbs. The taste is mild, with the slight sweetness of chicken broth, and without the greasy, sticky feel of inferior soups. Speaking of chicken, snake meat doesn’t taste like it, as some people suggest. It’s more like fish or perhaps eel, especially in terms of texture. Each bowl at She Wong Lam is served with a saucer of dried lemongrass and fried wonton skins. The lemongrass adds a fragrant zing to the heaviness of the soup, and the wonton skins are meant to be either dipped in the soup or dropped in to soak up the flavor before eating. She Wong Lam serves soup only in winter from 11 a.m. until 4 p.m., and Mak said they usually run out before then. The shop was empty when I showed up at 11, but customers slowly trickled in during lunch hour. They ranged from young office workers bolting down a quick bowl to a few elderly ones who hung around and told me they’d been patronizing She Wong Lam for more than 50 years. One older gentleman claimed to eat a bowl of snake soup every day during winter. He said that he’d never tried the snake liquor that the shop sells but that the soup was enough to keep up his internal heat during cold weather. He pointed to a sign on the wall that claimed that as snakes prepare for hibernation during winter, they become fatter and more nutritious. However, he wasn’t sure whether anyone in his family would be able to continue the habit, considering that many snake shops have closed in recent years. It’s a sobering thought that Hong Kong’s snake restaurants might go extinct (though the snakes themselves would disagree), not because eating snake soup is some kind of exotic culinary adventure that everyone should try, but because it’s such an integral part of an old-school Hong Kong lifestyle that has been gradually swallowed up by gentrification. But then, who knows? Perhaps a younger generation will find a way to make snake soup a trend and revive the industry with artisanal, organic snake soup shops. In Hong Kong, it’s entirely possible.